Asad Shafiq has class written all over him. He has the mastered the art of how to quietly reconstruct the innings when the side are up against it. Ideal for number 6, not a complete basher or a complete blocker. He knows when to hang in there and when to push on. He's playing the sort of innings VVS used to do for India. Momentous moment for Shafiq to get his first ton outside Asia. 30 odd for 4 against the best attack in the world and Asad Shafiq survives for 70 overs to lift the morale in the camp for these 2 tests. Grace, elegance, wrist work and precious ability to withstand pressure. 3) They've recovered exceptionally well from the 49 all out. Last 2 innings have lasted for more than 100 overs/3 sessions and we've had 4 50+ partnerships and 2 100+ ones. Given the attack they are playing against, this takes some doing. Only the top 3 are left to make a score of note now. 7) Pakistan have posted 330 or more in the first innings 12/19 times under Misbah. Generally, solid and dependable batting. 1) We've had 4 FULL sessions where we have only lost 1 wicket or less. There was an old theory that if you do this in a test series provided you have a decent bowling attack in your team, you are on track to do well in the series. 3) Repetitive stoic defensive occupation combined with six hitting calculated explosiveness. Misbah showing his versatility. He can bore the opposition in the field with obduracy before surprising them with a towering blow out of nowhere. We have a star player in Ajmal, yes, but by and large everyone has chipped in for the test wins at some stage or another. It hasn't been all individual brilliance. Collective efforts, measured approach, organised team structure has played a key part. We are playing the best side in the world in their own conditions. They are a skillful side and an accomplished one in more or less every department. We are playing in an environment that is unique and unusual for many of our players. Obviously, conditions have a bigger impact the longer the format. Cricket does not get harder than this. We might have lost 2-0, however we have also had our moments on this tour. We are up against the best number 1 side in the world game since Australia early 2000s; who are tipped to lead the way in the test arena for some time to come. Players require support and backing more than ever here. I repeat, cricket does not get harder than this. The vast majority predicted that Pakistan will give a better account of themselves in the 2nd test, but still doubted if they could win the test match on the poll we did at PCT. How right they were. The wicket was ideal; SA were a bowler down, our lot had a disastrous session. With the bat in hand on this tour we've either had a winning strong solid session of grinding out and accumulating steadily with only losing a maximum of 1 scalp (times 4) during it or have had a disastrous one where they’ve lost between 4 to 7 (times 4) wickets in quick succession. If they could have avoided some of the more ‘disastrous’ sessions into ‘average’ ones, the visitors would have been better placed. 1) Taufeeq Umar’s absence was a huge blow given his playing experience and past scores in South Africa as well as his opening record with Mohammad Hafeez. Nasir Jamshed’s inexperience has shown in his last 2 dismissals, a half hearted pull in Johannesburg and chasing a wide delivery today after being dropped at Gully from a leading edge in the same over, but you wouldn’t expect it to be different and it will be a fast learning curve for him. 4) Everyone knows Pakistan were severely undercooked and underprepared for this series to even compete respectably. It’s like an analogy of a student in a school year that goes through the semesters without doing any work until a fortnight before the exams and then expects to pass. They even prepare more seriously for T20 tournaments than a high profile test series against a formidable side. As professional as the current lot are, they are not done any favours by a board that seems to not care about their test match status as much as England, Australia and South Africa do. 9) Nice to see Tanvir back. Remember, he got 6 wickets on his test debut vs the same opposition in November 2010. Gets the new ball to talk and can bat a fair bit. How to Counter the Exceptional SA attack? 2) Leave most deliveries outside the off stump which are shaping away, offer no stroke, get a feel of the pace and bounce of the surface. You should happily let it go by, however keep the bat close to you as a second line of defence if the inswinger darts back in so you have a chance of keeping it out if initially misjudged. 5) Occasionally give him the walk to put him off guard rather than just letting him set you up. This requires bravery and courage when doing it vs a bowler with such pace, however this is why it's a test. When you are taking all the momentum forward it is natural to have a waft and start feeling for it outside the off stump with all the momentum taking you forward. You can also be bowled as you struggle to keep out the yorker if the bowler slides one in as you have less time to play. You need to have this in mind and only do it on the odd ball. 6) If you keep fishing outside the off stump, take an off stump guard and leave anything outside the eye line. Make sure you get forward and the head doesn’t fall over to avoid LBW when Steyn bowls a straighter line if you are taking such a guard. 7) If the balls are angling in before moving away with the new cherry or with the help of overcast conditions, open the blade, BUT only inside the line, not outside the line of the off stump as this is what the slip cordon and outswing bowler want to see. 8) Be unflappable and ride your fortune, you will need it! When Sri Lanka have been bowled out for 43, New Zealand have been bowled out for 45, Australia have been bowled out for 47, Pakistan have been bowled out for 49, doesn’t that tell you something about the quality of the bowling and the difficulty of the pitches? Dale Steyn deserves his due. You can criticise Pakistan all day, but one should at least have the courtesy to appreciate a sublime bowler, a sublime talent, a once in a generation bowler, a lethal bowler who has found the edge and ran through the defences of many highly respectable test match batsmen. In an age where batsmen dominate, seeing the ball angle, swing, zip through like it does when Steyn is charging in; is agreeably a refreshing sight. His accuracy is unerring, his swing is late, his pace is always up, and his attitude is one of a man who refuses to give up. This is undeniably the best ever South African test side that are tipped to dominate the world game in the test arena for many years to come. There are at least 5 players from the current side that would get into an all time South Africa test XI. Pakistan are a solid, consistently performing unit under their current captain, however it’s more through the qualities of team work, tactical nous, collective efforts, structured game plans and a stable environment that has contributed to their success as opposed to individual talent or sheer natural ability of an individual person. There is a debate that Younis and Ajmal will get into an all time Pakistan XI, but still it would take some convincing for others. The difference between the sides in sheer superiority, recognition and natural ability needs no further explanation. Misbah 8/10 – You can only write a song of praise for every test match he has captained in, even when the side has lost he has performed individually as was the case in Guyana. Captained smartly with his decision making and bowling changes on the opening day as the opposition was bowled out for the 5th time on the opening day of the series under his collective and cunning leadership. He looked much more assured and comfortable in his technique and method of countering the SA quicks and Kepler Wessels even went on to say he looked the best of the lot in the dismal 49 all out showing before being the victim of a controversial decision which saw him on his way for the 2nd highest score of the innings and 2nd longest innings. In the 2nd innings, Misbah top scored in the innings and played the longest innings of the test match in minutes with a determined and resistible vigil to take the test into day 4 when a 3 day humiliation was on the cards. It undoubtedly frustrated the hosts and restored much needed pride and confidence in the visitors’ camp with their stable level headed skipper continuing to thrive with responsibility. Misbah scored his 3rd half century this year in just as many first class games and has top scored on 4 occasions already in an innings this year as his persevering and relentless demeanour has consistently shown its effectiveness in negotiating safely, willingly and obdurately in a crisis. As ever, looked in his own bubble and unfazed out in the middle, content on following his firm structure and set of traditional principles, which have worked for him not only on slow and low wickets, however also on wickets with there is movement and bounce as this test match clearly showed. Consistent, reliable, dependable, re-assuring, methodical, structured, extra determined and rising above the rest as ever. His concentration and judgement was unstinting. 15 50+ scores in 30 innings since taking over and now has same the number of 50+ scores as Azhar Ali since November 2010 (when the Misbah era as captain started). Mohammad Hafeez 6/10 – Mohammad Hafeez took the most number of wickets in the test match from the visiting party. He was introduced into the attack, late on day 1 and picked up 4 wickets, some of them with the new ball which Misbah ul Haq delayed taking. As ever, most of the wickets came against left handers who he is ever so potent against. Hafeez didn’t last long both times with the bat, although got a bit of an unlucky leg side strangle in the second innings. His bowling played a crucial hand in keeping the South Africa first innings total down when they were 4 down for 170 odd at one stage with some of the front line bowlers barely threatening enough. Also, Mr Professor held on to the first catch of the series when Junaid knocked over Alviro. Hafeez claimed a wicket with his first ball of the series. Quite similarly, he also did so against Eng in the UAE when he nipped Cook out on the 3rd ball he sent down. Nasir Jamshed 6/10 - Did well to survive an over just before the close on day 1 and get off the mark the following day before being trapped in front in the early minutes of day 2 against the ever threatening Dale Steyn. Played aggressively 2nd time around, although he rode his luck along the way. Soft, embarrassing dismissal for him in the 40s when he was starting to develop a promising, hard to dismiss 2nd wicket stand with Azhar Ali as the left right combination worked wonders, just like Azhar and Taufeeq in the recent past. Given that he was on debut, it wasn’t the worst of beginnings for the talented left handed opening batsmen who is trying to adapt to the demands of the longer form which requires more discipline and patience in his game. These are qualities he will need to focus more on. I still expect Taufeeq Umar to be back in the side by the West Indies tour. Azhar Ali 5/10 – He survived for over 100 deliveries in the test match, gritted it out and showed a reliable defensive game plan. Both times Kallis knocked him over with a combination of planning and execution. It was thoughtful thinking from the champion highly experienced gifted all-rounder who incidentally is one of Azhar’s idols. Ali was committing on the front foot in the first innings and gloved one through as he wasn’t quite able to get the hands down in time whereas in the second innings he was camped on the back-foot anticipating the bouncer that they were testing him out, roughing him up with and which got him in the first innings as he fell to a fuller and straighter delivery. The most impressive part of his application in this test was his leaving and knowing where his off stump was as he judged and left with a degree of assurance. Unforgettably, took a blinder when Misbah ul Haq made an inspirational bowling change as he turned to Younis to get Amla. Ali clung on to a flashy stroke at Gully which was struck like a rocket. Younis Khan 2/10 - It was tentative poking outside the off stump from the middle order batting stalwart. He also survived a close review in his second innings. Younis now has 2 50+ scores in his last 12 test innings. However, the good old cliché stands, form is temporary, class is permanent. Asad Shafiq 7/10 – Outstanding pressure catches at deep square leg/deep mid-wicket in both innings to send Kallis on his way, a much prized wicket in any case. Shafiq played an irresponsible waft in the first innings, but perhaps that came as a result of some sustained pressure due to tight bowling with the scoreboard not moving while wickets were constantly falling like a pack of cards. Nevertheless, in the second innings and fourth of the test match, Shafiq continues to show why he is a man for a crisis. He is more than just a complete test match blocker as there is an element of grace and elegance about his strokes once he survives the initial stages. There was the odd rash shot, however by and large he was sound in defence and followed the instructions of the captain as he worked his way to a morale lifting half century. However, he has a tendency of losing his wicket against the new ball early in the morning after surviving to stumps and this is an area where he might want to think more about. He’s a classy, compact and consistently performing player who is just the right kind of number 6 the team could do with. Umar Gul 6/10 – 4 wickets in the game for the fast bowling spearhead. The opening bowler got Smith both times in his 100th test match as captain in his home city by just angling the ball across the leg side dominant Smith. He also intelligently dismissed Kallis by trapping him with the short ball. It was creative piece of thinking on his part. Gul played a lazy shot in the first innings and for a talented, capable and number 8 batsmen with a fair deal of experience he has got to be harder on himself with the bat. 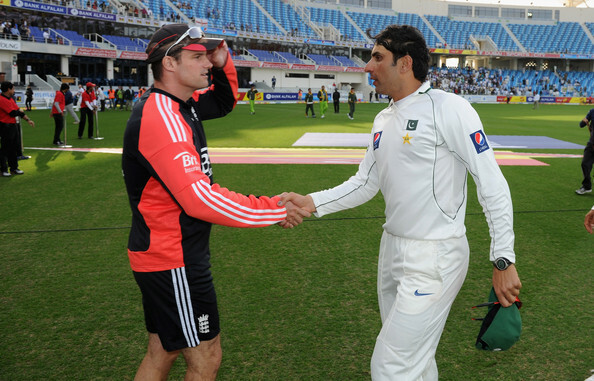 Saeed Ajmal 3/10 – 40 overs+ without taking a wicket for Pakistan’s best player. Ajmal hasn’t bowled much in the longer form of the game over the last 6 months and it showed in his lacks of wickets. Ajmal averages 40 without Rehman’s inclusion and there is little doubt that he is a much better and much threatening option when Rehman is plugging away and holding up an end as this allows him to attack and experiment more in shorter bursts and also pushes him to strive that extra mile and even takes some pressure away from him knowing the responsibilities in the spinning department don’t solely rely on him. Although Ajmal is a superior bowler on paper, the difference between him and Rehman in the longer form of the game is not much as what might be initially perceived. Ajmal was more or less playing a holding role, however if they needed someone to do that Rehman was a better option. Generally, Ajmal’s impact and effectiveness is maximised with Rehman also sharing the spinning duties as a front line option. At the beginning of Misbah’s tenure, Rehman was preferred as the front line spinner, not all that long ago. Two of the best players in the side, along with Younis need to lift their game. Rahat Ali 1/10 – Aamir Sohail rated him highly and generally is accurate in his assessment. Rahat was thrown into the deep end, just days after arriving in the country and failed to make any noticeable impression. Perhaps he is the 41st 1 test wonder to come out of the country. It was well mentioned on commentary from Pommie that you can’t select someone based on first class record just for the sake of it and need to look at what they will bring to the team that will help the cause and be different. Misbah has played 3 first class games this year and scored a half century in each of them. If you include the final ODI at Delhi, Misbah has top scored in an innings 4 times already this year, including the domestic 4 day title. We will bounce back in Cape Town. The Misbah-Shafiq stand was reminiscent of Cook-Prior at Ahmadabad, not only in their approach, but also the situation of the game. Both came in defeated causes, however were crucial in minimising the humiliating, restoring pride and giving them some positives to take away with an eye on the coming tests. They have spent valuable time in the middle, kept South Africa in the field, made them work for their wickets, frustrated them greatly, taken the test deeper and lifted the morale of the camp. Misbah batted like a wall, glue, a rock, and battled for his runs which he does ever so well in a crisis when the side are up against it and undoubtedly helped the less experienced Asad Shafiq get through the extended evening session, who also defended tightly and stroked them nicely.